Go ahead and prepare yourself for a major picture overload! I haven't been doing a very good job on taking and uploading pics, so I thought i'd edit some tonite and finally update this thing!! Actually, she's a puppy. But I consider those two to be pretty close. All day long at work, she sleeps. I kid you not, the entire time. Then as soon as we get home, she goes crazy. Literally. And this was his version of "smile Landry!!" The boys in their new speedos! Aren't they handsome!! Not sure what they were trying to accomplish here! Kaleb is the king of belly flops. 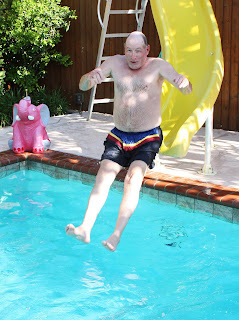 I have never seen a kid willing to do a belly flop, but he will! Grampy enjoying the slide! Tell me these are not the funniest pictures you've ever seen!! hehe, I LOVE this one! I even zoomed in for a close up! Landry's turn! He honestly has no fear. The slide is his favorite thing! See how happy he is!! My baby is so big! It breaks my heart to know he's not a "baby" anymore! And days like this leave us with a worn out Grampy!! I hope everyone is enjoying the start to their summer! It's been gorgeous here lately and this weekend is supposed to be 99-104 through next week! Needless to say, I see more pool time in our future! Congrats to my cousin Kim and hubby Mark on sweet baby Chloe finally arriving! She's such a cutie! And happy birthday to my lovely mom! I hope you had a great one! We love you! You're the best! Fun in the sun!! Dad's pictures are really funny. Landry is going to be a fish like the boys. I'm hoping he will like his swimming lessons. Cute pictures. Good pictures of family fun together. It was a nice day to celebrate your mothers birthday. I enjoyed her birthday too remembering wonderful memories of June 2 1957. Glad the family has a nice pool to spend time together. Your parents are so proud of all the kids(old and young). Swim Lessons & Big Boy School!